Can You Eat Raw Foie Gras? Salami's white casing is entirely edible. 3 How Long Does It Take for Pork to Spoil When Not Refrigerated? 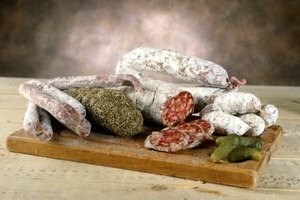 Whether your dry salami is Genoa, Milano or pepperoni and made with pork, veal or beef, it is by definition a preserved meat and long-lasting. Backpackers swear by salami's long shelf life, making both cooked and uncooked gourmet meals from it night after night in the wilderness. The preservation process makes salami long-lasting outside the refrigerator too, but there are still limits on how long it can be kept at room temperature. If your dry salami does not have a "Keep Refrigerated" label, it is a shelf-stable variety. 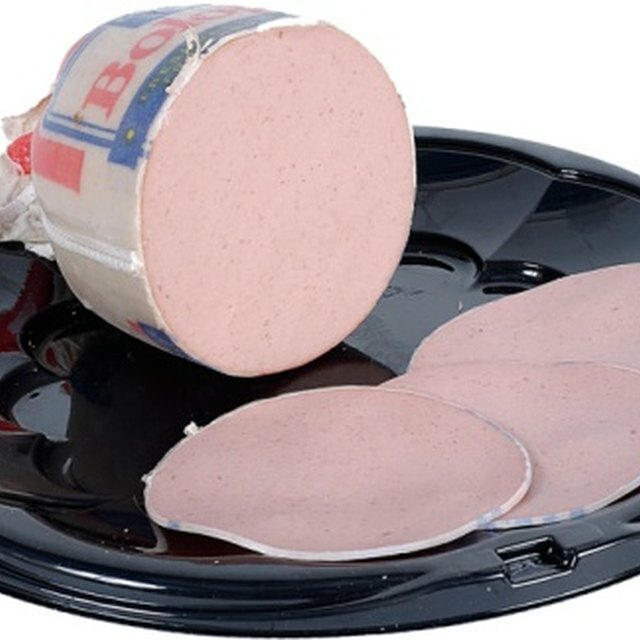 The lack of a label means that if the casing is intact and not cut, the salami can be kept safely unrefrigerated for several years, note Sharon Tyler Herbst and Ron Herbst, authors of "The Deluxe Food Lover's Companion." On the other hand, the U.S. Department of Agriculture recommends that you limit the time on the shelf to six weeks even for uncut salami. Once you slice into the salami, you break the protective casing and harmful bacteria can enter into the sausage. Ironically, harmless bacteria are also used in curing salami. The white casing on the outside of salami is an edible mold called penicillim that blocks other bacteria from entering the sausage. Once salami is cut, put it in the refrigerator, where you can keep it for up to three weeks. The curing process for salami, consisting of a mixture of salt, sodium nitrate and lactic acid bacteria and air-drying, kills off harmful bacteria. But because the salami has not been cooked, the USDA recommends that older adults, young children, pregnant women and people with weakened immune systems avoid eating dry salami because there is a risk that some harmful bacteria may still be present. From the Italian "to salt," or "salare," salami has been made for hundreds of years by people all over the world who relied on its long shelf-life. Early Cyprians may have cured meats around 700 B.C. and Native American made a version called pemmican with buffalo and venison meats, fat, berries and herbs. Italian immigrants were among the early American salami-makers, bringing curing techniques to San Francisco, among other areas, in 1917. Can Eating Expired Frozen Bacon Be Bad for You? What Cut of Meat Do You Use to Make Pastrami?